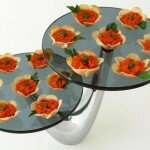 March 22, 2013 By This post may contain affiliate links. 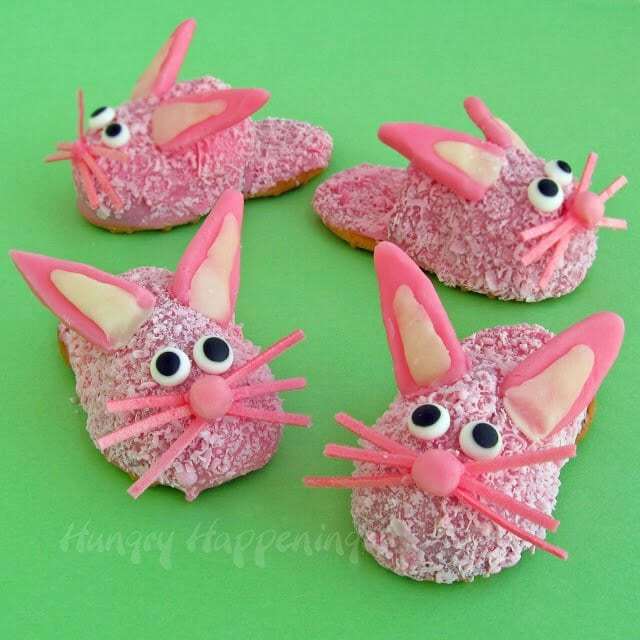 Everyone loves Nutter Butters, so try making these adorable Easter Bunny Cookies – Bunny Slipper Cookies! 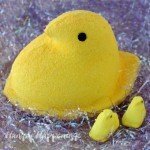 These festive Easter treats will be a great addition in your Easter Basket! The idea to make these Bunny Slipper Cookies has been rumbling around in my brain ever since I created my Pink Fuzzy Slipper Cookies using Nutter Butter Cookies. Why, you ask has it taken so long for me to post them? I didn’t write the idea down and I have fuzzy brain syndrome, a.k.a. middle age. I kept forgetting about them. I’m so glad the idea finally came back into the forefront of my mind before Easter arrived. My Pink Fuzzy Slipper Cookies were made using Nutter Butter Cookies as the base of the slipper and peanut butter fudge was used to create the rounded part of the slipper. Each cookie was dipped in pink candy coating then sprinkled with shaved pink candy coating. I just added some eyes, whiskers, ears, and a nose to turn the slipper cookies into Bunny Slipper Cookies. 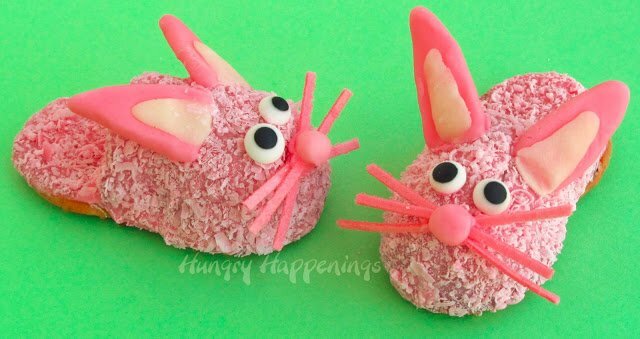 As I put these together, I decided instead of making a whole batch of peanut butter fudge to make a handful of bunnies to show you the tutorial, I’d use up some cake that I had leftover from making my Carrot Top Cupcakes earlier this week. I whipped up some cake ball batter and used it in place of the fudge. Both work just as well. I just stuck the cake ball onto the Nutter Butter using some of the melted pink confectionery coating as “glue” and shaped it just as I did with the fudge. You can see the complete tutorial to make the Pink Fuzzy Slipper Cookies here. 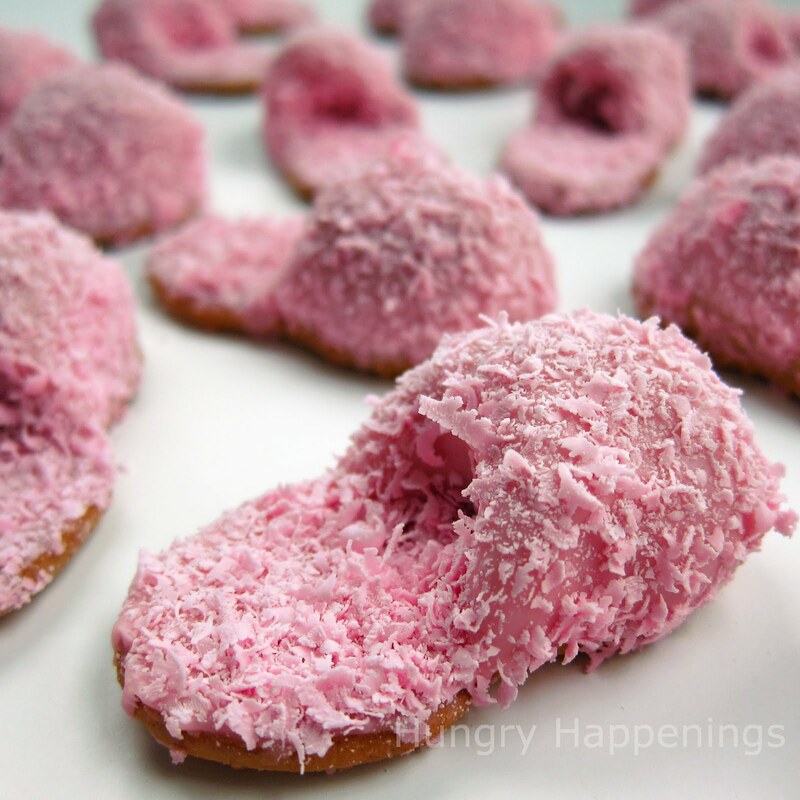 Go here to see the tutorial to make the pink fuzzy slipper cookies. Then come back here to see how to decorate you bunny slipper cookies. Color some modeling chocolate bright pink and some light pink. Pinch off tiny pieces of light pink and roll into balls to create the bunny noses. Pinch off pea size pieces of bright pink modeling chocolate, roll into tear drops then flatten. Pinch off tiny pieces of white modeling chocolate and roll into tear drops. Press onto the pink piece and flatten. Cut off the bottom edge to create the bunny ears. 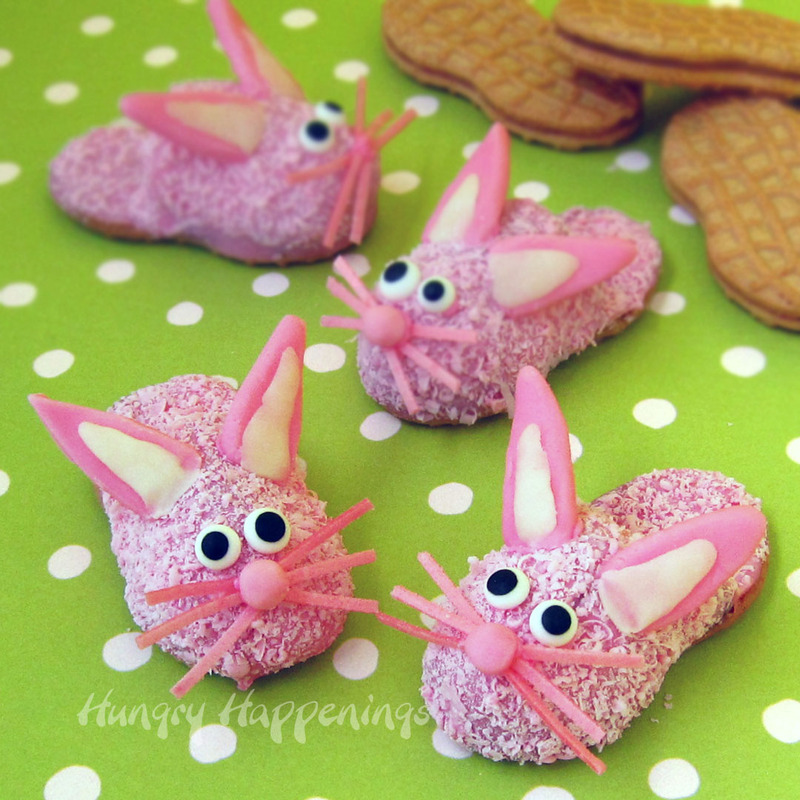 Cut pink edible Easter grass into small pieces to create the bunny whiskers. 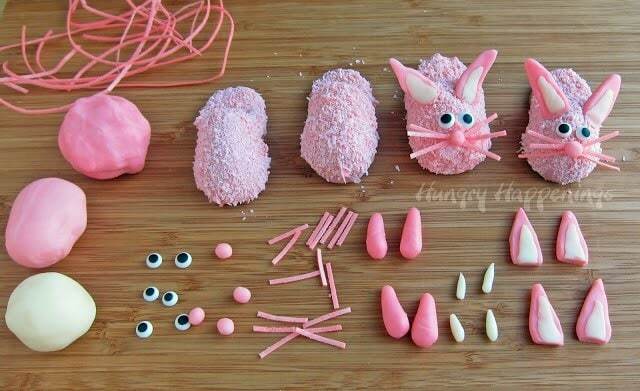 Use left over pink candy coating as “glue” to attach the candy eyes to each pink fuzzy slipper cookie. Add a dot of candy coating below the eyes in the center, attach six whiskers then add more candy coating and attach the nose. Cut the bottom back edge of each bunny ear at an angle then use candy coating to attach it to the pink fuzzy slipper cookie, so that the ears don’t stick straight up, they angle towards the back of the slipper. As I’m looking at the pictures of these cookies, I realized they would have looked cute with a fuzzy little tail. Too late. I’ve already taken over 100 pictures. Oh, well, you can add them to your cookies, if you’d like. 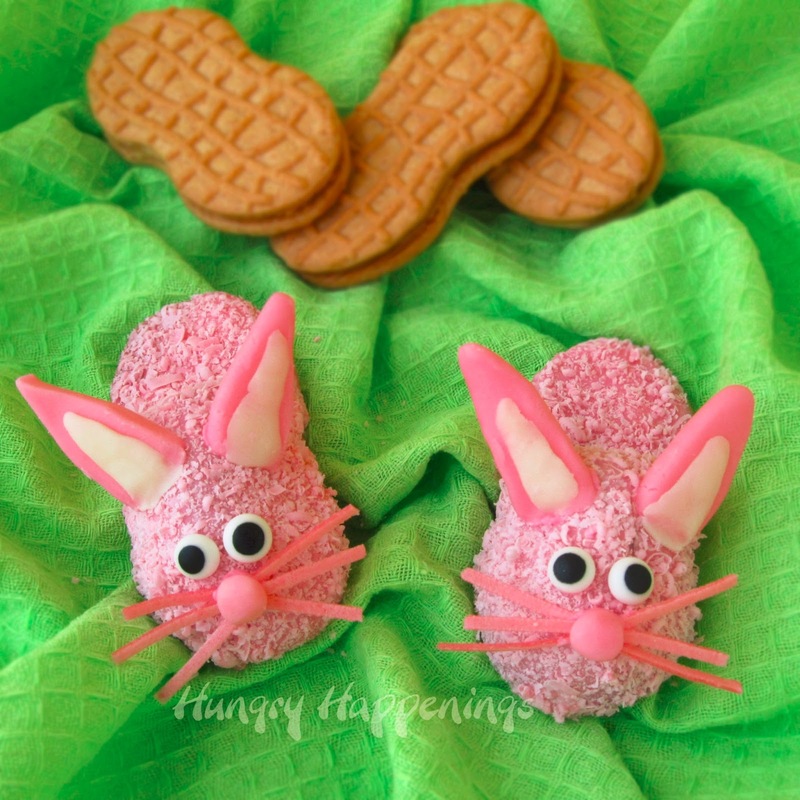 Your Bunny Slipper Cookies can be made in all sorts of colors for Easter. They’d also be cute for a slumber party, a spa party, or a kid’s birthday party. 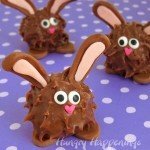 Yes, every time I go into the kitchen to work on my Easter chocolate orders I get sidetracked by a new idea. I just organized all my orders and will concentrate on making chocolate all weekend, but I have a few more ideas I want to share here next week. Busy, busy! SO adorable!!! OMG and they are made with Nutters. LOVE! Beth, you know how amazing I think you are – but these are, by far! – the cutest Easter goody out there today. 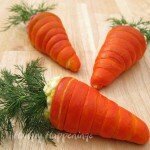 I think they are going to rival your carrot cones in universal and timeless appeal! DARLING!!!! I can't take it any more. 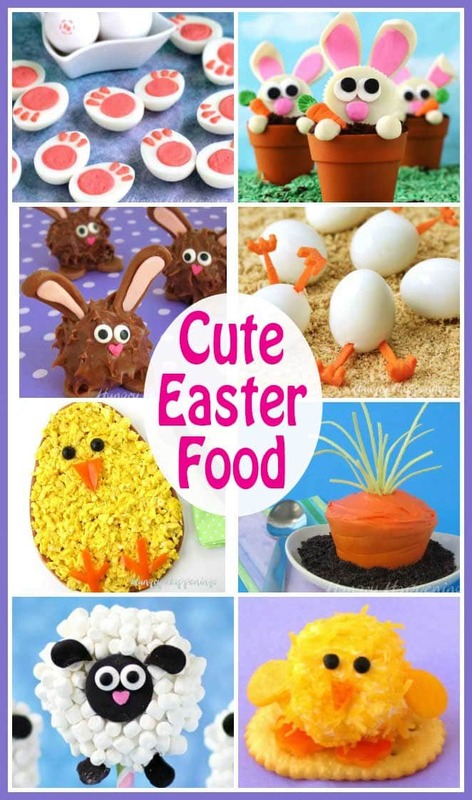 It's so hard to decide which of your too cute ideas to use for Easter. My little brain is on overdrive, but I love it. Can't wait to open your posts and see what other incredibly cute idea you've come up with. 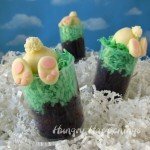 I'd never heard of edible grass til one of your recent posts. for your followers – found it yesterday at Walmart in pink, green and light blue in the $2.38 or so price range. Originally thought it would have to be ordered on line. Your photos are always so helpful. By holding the slipper in your hand it becomes obvious how big/small it is. Since they're made of Nutter Butters -we SHOULD know, but a photo is worth 1,000 words. I know, I've given you so many options this Easter. I just can't help myself. I found packages of edible grass at Jo Ann Fabrics and think I saw them at Michael's as well. It is becoming pretty popular for Easter. It's fun to work with. I just finished making dozens of carrot shaped rice krispies treats and used the green grass. I'm not really wild about the flavor of the grass, but my exchange student can't quit eating it. She really likes it. So, you'll have to decide for yourself if you like it or not. The different colors usually have different flavors. These slippers would be perfect for a little girl's sleep over birthday party. Love Nutter Butters. I am thinking about doing another Easter post using them. I'm going to experiment today. Hi Cathleen, Oh, that is too bad that they don't sell them in Canada. You could make your own cookie cut out in the same shape or find another cookie that is shaped like a long oval to make this project. I had just finished making my slipper cookies and had sat down to edit my pictures when your post showed up in my e-mail box. I love how you added the little bunny slippers to your egg family. They were so cute! Oh.my.gosh. Cutest bunny slippers ever! What a fabulous idea! These are adorable. Amazing talent. Thank you for the great tutoral. These are so cute! Amazing job! These are so creative. I’m now following you on twitter and pinterest…and tweeting and pinning this. Have a lovely day!! Haha, these make me smile and the fact that they are made with Nutter Butter's is the icing on the cake!! I would love for you to come and link these up to our party! These are absolutely darling. 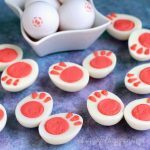 What a fun treat for Easter or girls' party – so creative and cute. I'm sure they taste wonderful, too! These are so stinkin' cute! Pinned! These are super duper cute! LOVE them! 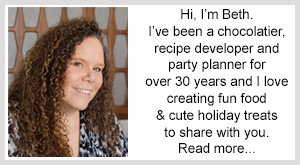 I am featuring this on TGIF this week here: http://www.123homeschool4me.com/2013/03/tgif-linky-party-69.html – Feel free to grab an I was featured button if you like. Thanks again for linking up and sharing your creativity with the rest of us. Thanks for the feature. Happy Easter to you too!